If you are still searching for the perfect venue with a capable team of vendors to complete your special day, then we have an invitation for you! On July 29th from 12pm to 4pm, we will be hosting an open house featuring the Triangle’s premier vendors. The Wakefield Barn is a historic property that was originally a dairy farm. Renovated to be a heavily sought-after wedding venue, the Barn features a beautiful stable area, open reception/ceremony space, bridal and groom suites, horses, and patio. 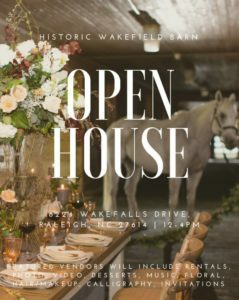 Come to tour the barn and meet incredible vendors, all at a convenient location in North Raleigh. We hope to see you there! For inquiries, email jessica@southernoakevents.com. For a sneak peek of the venue check out our photo gallery, browse our menu packages, and learn more about our history.